I love almost any project that include paper, fabric and sewing. For this one I especially like the "deconstructed" edges and things a bit imperfect. This stationery set, in it's own little portfolio, might be a fun project for the long weekend....and a great gift for someone special. 1. You will need a small piece of fabric. I chose this Wavery print that I had in my stash. I love the washed out look and the texture in the weave. Lay your fabric face side down on the printer screen and copy onto white cardstock. For a little more dimension use a textured cardstock - like Bazzill's burlap or crisscross. 2. Fold your printed cardstock in half long ways and cut to size. Folded, mine are 4" x 5 1/4". You can get 2 cards out of each page printed. Pink the right edge. 3. Print "thank you" or other sentiment onto fabric. Also print a sentiment that will be stitched to the stationery cover. I did "materially speaking" since this project is all about fabric, but you chose what you want. 4. 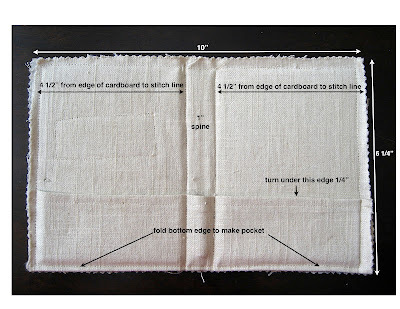 To print on fabric, cut freezer paper and fabric to 8 1/2" x 11". Iron the shiny side of freezer paper to fabric. If edges of fabric aren't completely adhered to freezer paper you might need to tape down the edges. Or, you can also purchase printable fabric at your fabric store. You may chose different sentiments for an assortment if you like. 5. Cut your sentiments apart with pinking shears. 6. Sew the fabric sentiment to the card. 1. Lay a linen or other textured fabric on your printer screen and copy onto white cardstock. Again, you can use a textured paper if you like for more dimension. 2. Cut out your envelope from the printed cardstock. Use an old envelope for your pattern. When folded mine is 5 1/2" x 4 1/4". 3. Cut, fold and glue the sides. 4. I stitched along the edge of the flap. 1. Cut a piece of corrugated cardboard to size (I used the flap of a shipping box). Mine is 10" x 6 1/4". Make sure the corrugated lines in the cardboard run the same direction as the short side....this is so you can fold it over to make a spine in your portfolio. 2. Use the cardboard as your pattern and cut a fabric piece slightly larger (about 1/4" larger all the way around) for your front cover. 3. Cut a piece of fabric (I used linen) for the inside. Cut the same width as the cover fabric piece in step 2 but add 2 1/2" to the height. This will allow a fold along the bottom edge to create a pocket. 4. Turn under 1/4" along long edge and stitch. 6. 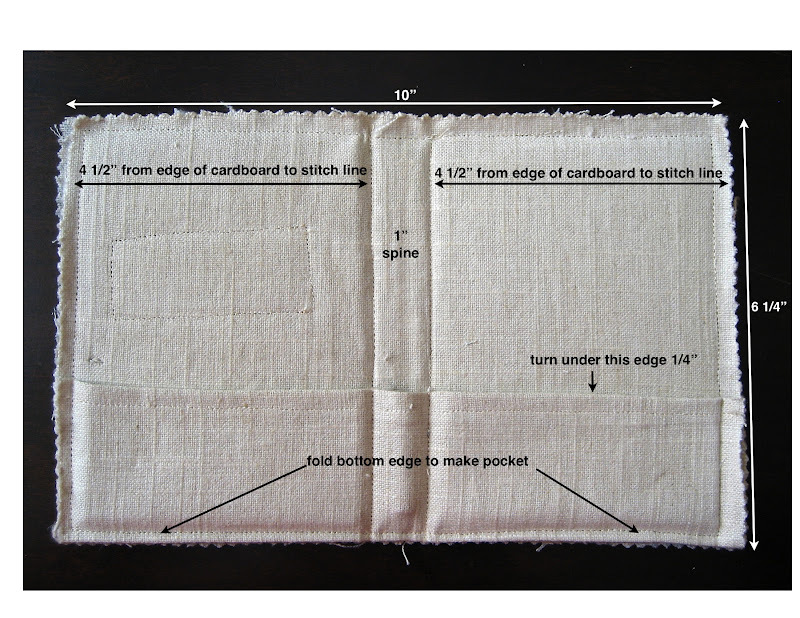 Apply a little glue stick to both inside and outside fabrics and attach to cardboard piece and stitch as shown below. TIP: Apply just enough glue stick to keep fabrics in place to sew them down. Try to avoid putting glue where you will be stitching. DETAILS: stitching lines, fold line, dimensions, etc. 7. Stitch front patch onto cover. 8. Sew button and twill closure onto front cover. I wanted my button to look more worn like the fabric so I sanded it lightly. Here is what the button looked like before I sanded it. All done!! Look how cute the cards and envelopes look inside the portfolio. Add something fun to write with. I even attached some extra sentiments with a bamboo paper clip. Have a great long weekend....do something fun! This is wonderful. Love the idea of copying the paper. I'm definitely going to give this a try this weekend! Lovely! Thank you for the tutorial! What a wonderful idea! I love the textured look of the "copied" fabric! And your stitching really makes it look so real! TFS! Great Project! My mind is atwirl with the possibilities!!! Thank you for posting ALL the details! What a wonderful project - thanks so much for sharing all the steps! I just love your fabric colors too!!! So many great ideas! Love this project. Adorable! A great gift idea. Thanks Deb! Love this project and your blog too. Thanks for sharing. beautiful - love this = great fabric ! I just love this project. Going to try it soon as a gift for a good friend. Thanks so much for sharing - your blog is full of wonderful ideas! Just an Instagram kinda day.